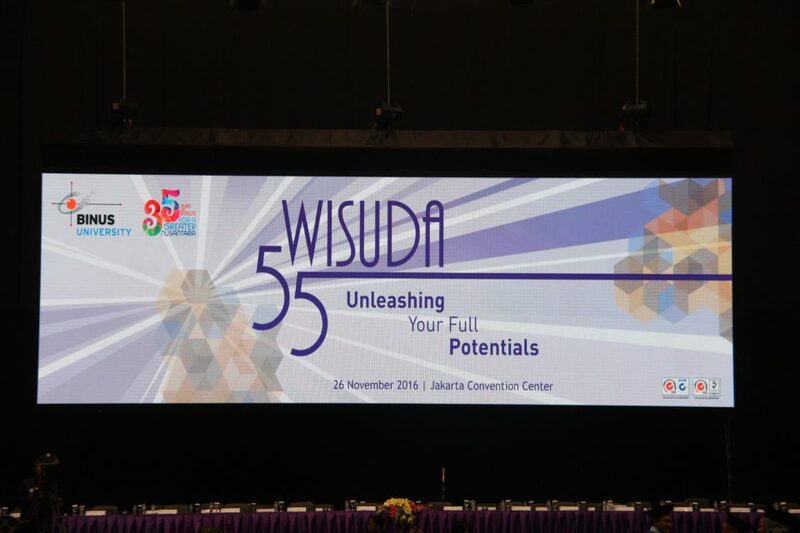 BINUS University held its 55th Graduation Ceremony at Jakarta Convention Center (JCC) Senayan, Jakarta, on Saturday, November 26th, 2016. 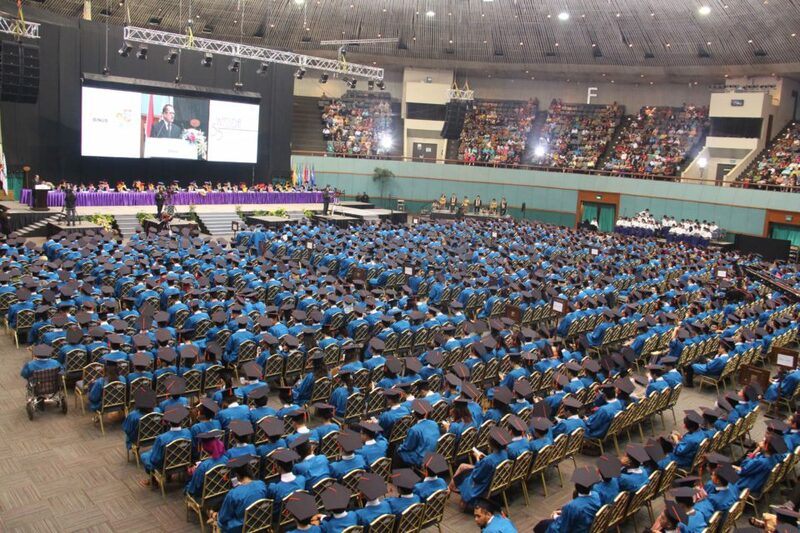 A total of 3.356 students were graduated in the ceremony that was divided into three shifts. In his speech, Prof. Dr. Ir. 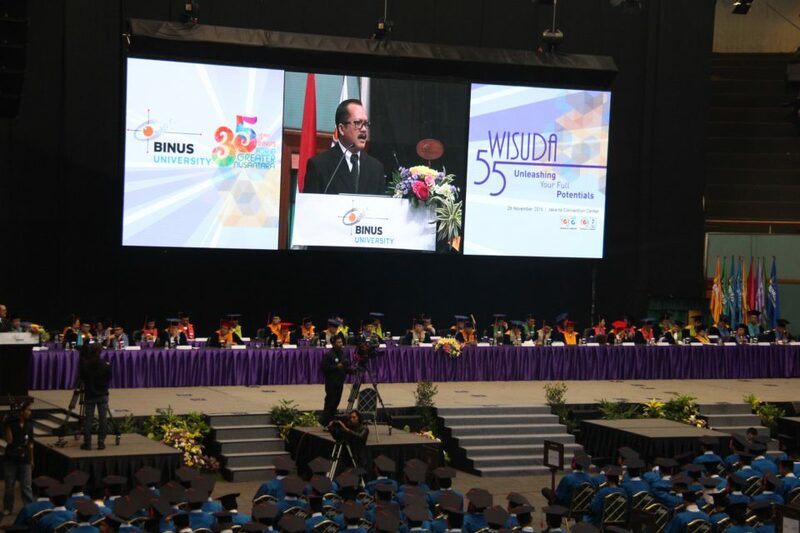 Harjanto Prabowo, MM, the Rector of BINUS University, expressed his pride and expectation towards the graduates. 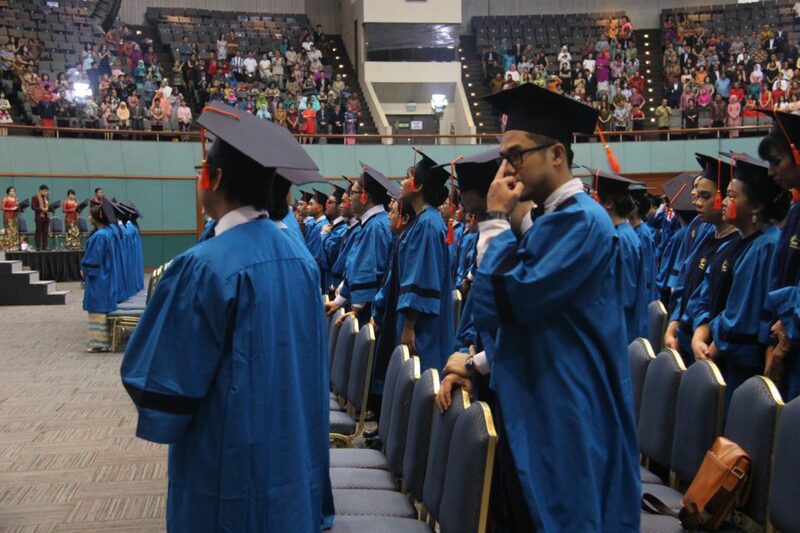 “We believe that the alumni of BINUS University can contribute in the community, as well as become future leaders that can make a change in the community for the better progress of people, nation, and world,” he said. 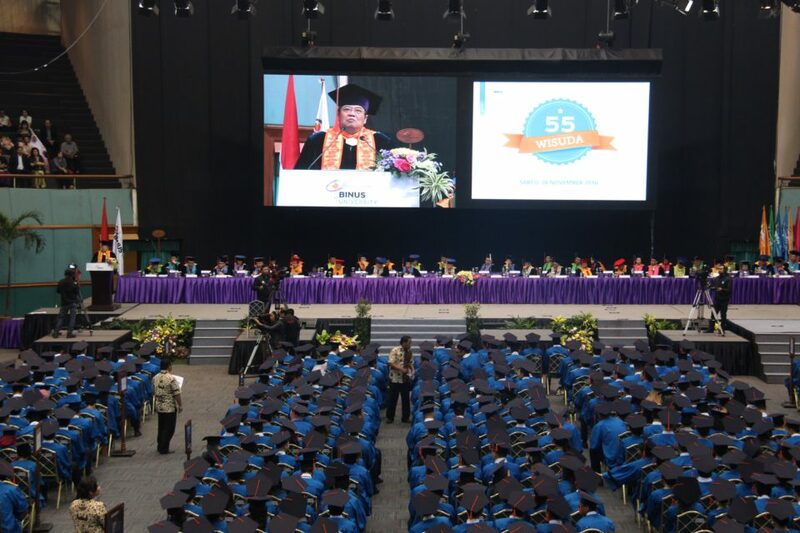 In its 55th Graduation Ceremony, BINUS successfully graduated 25 graduates with the predicate Suma Cumlaude, and three of them obtained prefect GPA (4.00) and were awarded with Binusian Award of Excellence. 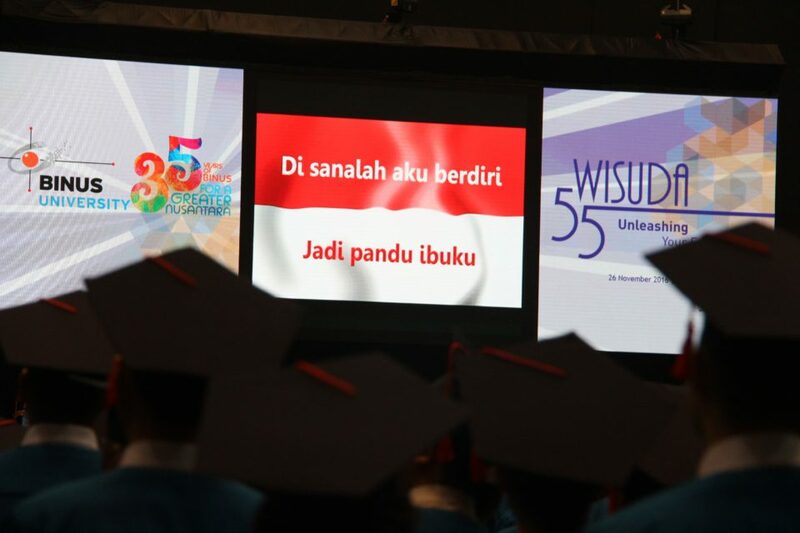 BINUS also awarded Wibowo Award and Binusian Award for the graduates with outstanding achievements. From the total of 3.356 graduates, 69% of them are now already working. 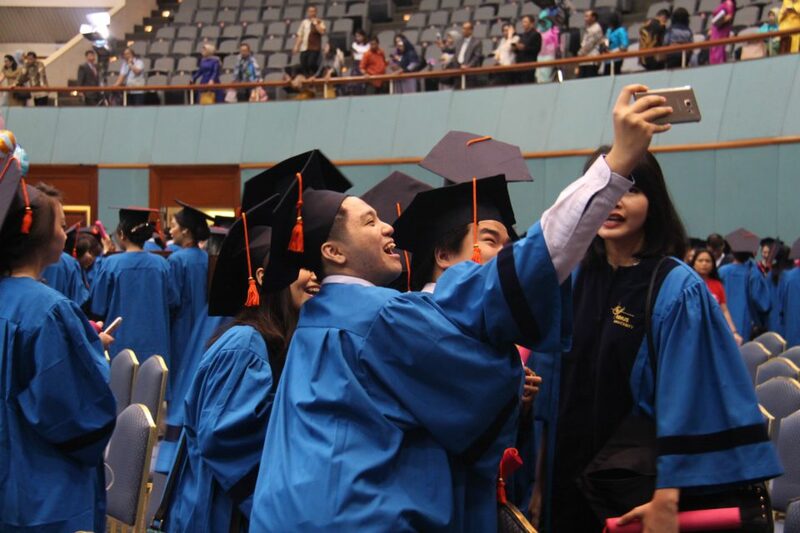 24% of BINUS’ graduates are now working at global or top national companies, and 17% become entrepreneurs. The youngest graduates are 20 years old (Bachelor’s degree), 22 years old (Master’s degree), and 47 years old (Doctorate degree). Meanwhile the oldest graduates are 48 years old (Bachelor’s degree), 58 years old (Master’s degree), and 47 years old (Doctorate degree). The Rector hoped the graduates, after the graduation ceremony, will never stop learning. 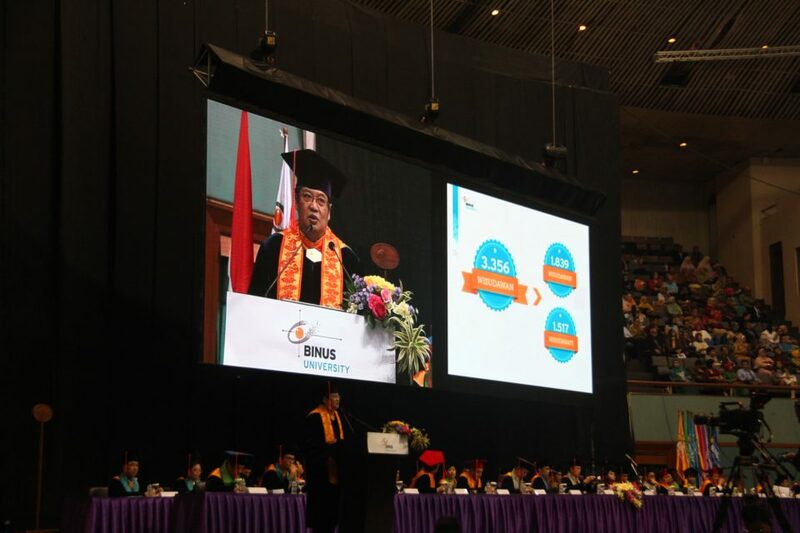 He said that the graduates need to improve their skill and knowledge, especially because Indonesia is currently involved in global economy era, such as MEA (Masyarakat Ekonomi ASEAN) – an economic integration in Southeast Asia region, which is full with great challenges and opportunities. “Therefore, now is the time to maximize our innovation, creativity, and productivity, instead of only making proud of our natural resources but can’t use them wisely,” he added. GOOD NEWS! INNOVATION MAGAZINE NOW AVAILABLE AT SCOOP!